This is a nice and healthy way for a vegan to put on size with carbs and protein... Remember don't cheat yourself, treat yourself. 2. Layer potato and onion in a 2 Qt/ size casserole dish (with lid). Finish with a layer of potato. 3. Next, place all of the alfredo sauce ingredients into a blender. Blend on high for a minute or two until smooth and creamy. 4. 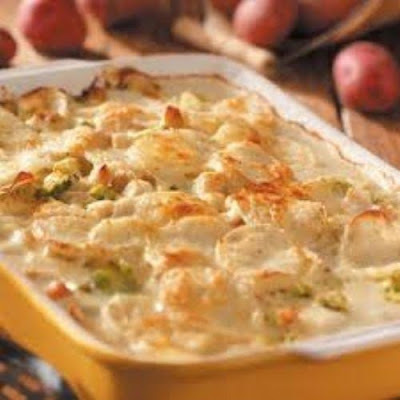 Pour the alfredo sauce evenly over the potatoes, making sure that the sauce runs down and around the sides of the potatoes. Lightly sprinkle with nutmeg or paprika, and cover with a lid. If you do not have a baking dish with a lid, use some aluminum foil to cover it tightly. 5. Bake in oven for 15 minutes. Remove the lid and place back in the oven for another 15 to 20 minutes until the potatoes are cooked through and the top is browned to your liking. Note: The alfredo sauce makes enough for 2 bakes or extra for over pasta. Will keep in the fridge for about 5 days. & for creativity ad some broccoli to it.